Arundhathi Subramaniam is the author of three books of poetry, most recently Where I Live: New and Selected Poems, and a prose work, The Book of Buddha. 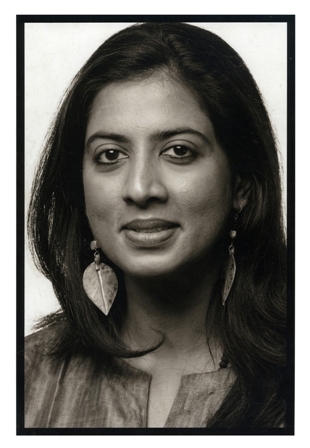 As editor, her books include an anthology on sacred journeys, Pilgrim’s India; an anthology of Indian poetry, Another Country; and a co-edited anthology of contemporary Indian love poetry, Confronting Love. She has also penned the bestselling biography, Sadhguru: More Than a Life. Her new book of poems, entitled When God Is A Traveller, is forthcoming this July. NAW- Tell us about your literary journey. How and at what age did you start writing? I began writing poems pretty much as soon as I learnt to write – as is the case with many kids, I think. And even in my pre-literate days, I was composing all sorts of absurd songs and rhymes. Of course, my adolescence was filled with verse scribbled in journals – all more rage than form. The first poem that I can stand by is a poem called ‘Amoeba’, which I wrote when I was around 19. It went into my first book, On Cleaning Bookshelves (2001). It took me a long time to find a voice I could call my own. And that’s because it takes so long to grow into oneself, doesn’t it? You spend so much time believing others possess a superior wisdom. And often, that’s true! But you still have to integrate that into your life and make it your own. Until such time, you’re an apprentice. A promising apprentice perhaps, but still an apprentice. So I spent my 20s writing furiously – and sometimes well – but I was filled with doubt, and was quite an expert at self-sabotage! I’m glad my first book was published when I was in my 30s, when I was more aware of my literary choices and why I was making them. Obviously, on some level, you’re always an apprentice. That’s because the journey of self-discovery is an endless one. And as long as you’re receptive, you’re always learning, borrowing, mimicking, in one way or the other — not just from the cultural world but of course, the natural one as well. But still, I do feel I know a little more about my voice now – its timbre, its body, its aspiration. And I have a keener sense of my way through a poem; I know when I’m taking the easy way out, when I’ve arrived at something real. Your sense of smell grows keener the long you hang around any medium, isn’t it? You begin to recognize an authentic moment because of the smell of danger. NAW-Tell us about your works (especially the book on Sadhguru). Poetry was always primary in my life. And that had to do with a love of language, its rhythms, its textures, its tones. Also, it seemed like the shortest, most direct and most pleasurable route to the self that I knew. But always significant – on a subterranean level — was an interest in philosophy and mysticism. When Ravi Singh of Penguin India commissioned a short book on the Buddha (The Book of Buddha was eventually published in 2005), I was delighted, because Eastern spiritual traditions, Buddhism in particular, had long been a source of fascination. But it was my encounter with my spiritual guide, Sadhguru, a yogi and mystic, which became a defining moment in my life. It had been preceded by a lifetime of unconscious search – and at least seven years of active quest. So, it was a momentous discovery. When I started work on his biography in 2006, it was with excitement and fear. On the one hand, what can be more wonderful than spending time on your greatest preoccupation – a spiritual master who happens to be your guide? On the other hand, how can you presume to understand the inner life of a mystic, an inner life that is so much more complex and eventful than your own? So, it was a challenging journey. Lots of long conversations with Sadhguru were the bonus. Lots of spells of doubt over how to find a tone for the book constituted the more terrifying spells of the process. I wanted a tone of wonder and scepticism, which is a tricky mix to arrive at, and not found often in spiritual biography. So, it took time. It was a journey of faith, with all the lapses that go along with the journey. It was eventually published in 2010. NAW-How difficult is it to sell poetry these days when the literary field is dominated by prose? Not easy. But then poetry, in the more literary sense of the term, is seldom a commercial proposition. Ad jingles and movie songs, which are also poems of a kind, are hugely popular. So, these various genres of poetry exist, as they must, and that’s fine. I’m not despondent about the future of poetry. If anything, with the upsurge of lit fests in the subcontinent, literature is becoming particularly fashionable – sometimes even in mildly alarming ways! Also, there are major publishers like HarperCollins, and smaller publishers like Poetrywala and Pratilipi with conscious poetry agendas, which is heartening. A vital area where work needs to be done, I think, is in introducing more energized and innovative ways of teaching poetry in schools and colleges. This could empower young people and win over many more potential readers. A major reason people don’t read poetry is that they’re afraid of it. We need to reclaim poetry as a source of pleasure — as a verbal art that allows for aesthetic delight. If we don’t recognize that, it could just turn into just a form of versified journalism. That would be a travesty of its incredible potential. NAW- Tell us about your collaborative works. How is it working with another artist? How does the liaisoning work for an artist? Do you feel it limits your creativity in any way? Personally, I’m wary about collaborations; I certainly couldn’t collaborate with just any artist. It has to be someone I trust on many levels. Also, it takes forever to understand poetry as a form; so where is the time to start entering into other disciplines before one has fully figured out one’s own? At the same time, with someone who shares one’s vision and basic artistic values, and who’s not tripping over her or his own ego, I’ve found collaboration can be exciting. The first collaboration I worked on was with visual artist-photographer Vidya Kamat, who invited me and sociologist Gita Chadha to work with her on an exhibition in 2003. The theme was the pre-menstrual syndrome (PMS), and it was the first time I was actually being commissioned to write a poem. That delighted me. My poem, ‘Tomorrow’, was born of that interaction. Subsequently, I’ve collaborated on a couple of dance-poetry productions with the Bharata Natyam dancer Alarmel Valli, an artist of extraordinary talent and integrity. We work well together because there’s this bedrock of mutual respect. She’s a perfectionist, and just as sceptical as I am of collaboration as possible gimmickry. That resonates with me. We’ve collaborated only when we’ve been convinced of it. When she choreographed and performed my love poem, ‘Vigil’, in a production entitled Only Until the Light Fades, I realized just how sensitive and sophisticated an artist she is in terms of her understanding of not just dance, but music and poetry as well. She knew my poem much better than I did at the end of it! NAW- When you are reading, do you prefer ebooks or printed paper books? Material, printed, non-virtual, tactile books! Always. I’m glad e-books are around, but I don’t read them. It’s a generational thing, I guess. I’m too habituated to the old technology. Also too addicted to the smell of libraries. That’s a tough one. Too many to name. Currently, I’ve been spending a lot of time reading medieval mystic poets, so I’d say Nammalvar and Tukaram. Otherwise, up front in my bookshelves currently, for various reasons, are Neruda, Basho, AK Ramanujan, Adrienne Rich and John Burnside. In terms of spiritual literature, the books that are never far from my side are Nisargadatta Maharaj’s I Am That, Eckhart Tolle’s Power of Now, Clarissa Pinkola Estes’ Women Who Run with the Wolves, Sogyal Rinpoche’s Tibetan Book of the Living and Dying, and Sadhguru’s Mystic’s Musings. And when I’m in the mood for narrative, I turn to the 19th century women writers, from Austen and Bronte to George Eliot. And god bless the British women crime fiction writers of the 20th century – Christie, Allingham, PD James. They’ve seen me through dark times. NAW- How do you write, in fits and starts or in one go? Take us through your writing process? Seldom at one go. It sometimes starts with a verbal image and sometimes, if one is lucky, an image with a tone. At other times, it begins when mulling over an idea, but even ideas aren’t just abstract entities, are they? They’re part air, part substance. You can almost touch them. And that’s the moment I wait for – the moment when an idea becomes sensuous, grainy, thingy. I might work on a poem over a few days. After that, I put it away and don’t return to it for a while. It’s like putting a lid on it, and allowing it to stew in its own juices. Later, I arrange an ‘accidental’ re-reading of the poem for myself. (I do it as casually as possible so the betrayal, if it happens, won’t hurt too much!) If the poem grabs me at that reading, I hang on to it. I might fine-tune it a bit, of course, but it’s this reading that decides whether I can trust it or not. NAW- What do you do when you are not writing? I read. I make time for yoga. I seem to travel a great deal, thanks to my work. I’m afflicted by a very real wanderlust, and I’m grateful for the many places to which poetry has taken me. Places I never dreamed of visiting. I’ve also chosen to live between not just different places, but between contexts – between a yoga centre and ashram in Coimbatore and the city of Mumbai/ Bombay/ Bambai – so that requires a constant changing of gears, which is challenging and interesting. And if all that sounds too solemn, I enjoy meeting friends – preferably one on one — over a coffee or a meal, and I like going out dancing once in a while! I’ve been working on an anthology of Bhakti poetry, as editor, which has allowed me to spend three years reading a delicious bunch of ecstatic, despairing, sometimes lunatic, mystic poets. The book’s entitled Eating God, and should be published by Penguin in September. It’s been a period of tremendous discovery, personally. And I think the end result is a collection of rich and passionate voices. It’s meant as much for spiritual seekers as for lovers of poetry.